Looking for a quick and easy idea for Christmas Gift Giving? 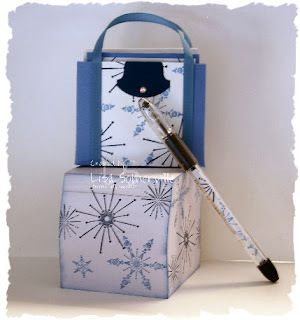 Grab your Snow Burst stamp set, two shades of blue ink and some blue and white card stock! You'll also need, the round tab punch, sticky strip, and (2) 10" pieces of coordinating grosgrain. The tote featured below is the same tote that I posted here on my blog back in April, I just changed out my colors and stamps for the season. The tote holds (4) 3" x 3" cards with envelopes. I also added a bit of "bling" (glitter adhesive) to my round tab punch. The note cube is from Oriental Trading. I picked up the RSVP Pens at Office Depot - these are great, just some simple stamping on a piece of copy paper (3 1/2" x 1") unscrew your cap, roll your decorated paper around the barrel, and pop back in to the pen. Now you've got a coordinated pen to match your project! Don't have the Snow Burst stamp set? Email me today to order yours - this set is only available through then end of November! Great little projects! I always love having things like this on hand for a quick gift! Thanks for sharing your wonderful idea Lisa!